"A brilliant fast paced adventure story, perfect for children who are intrigued by the dark side!" Er... It looks a bit weird... ​Is it really suitable for kids? YES! This is nothing but fantasy and fun. There are no horrid deeds or descriptions and you'll find far worse standing on your doorstep on October 31st demanding candy. It's just fast-paced adventure with a kooky theme that appeals to kids who have a curious side. In fact, teachers have even said that it has converted reluctant readers. The story lines can be used to raise interesting conversation topics if you want to get serious, but you can be certain that there will be no nightmares. And it won't offend cultural sensibilities. It's just a bit of fun. Unless you absolutely hate snails, then it might be a bit less fun. Read my interview on the Reviews page. There is plenty of interesting reading on the subject of children's books and darker themes. See below. 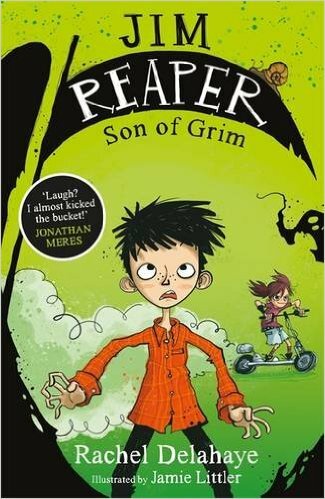 Jim Wimple (a.k.a Reaper) is an ordinary kid with an ordinary family. Well... his mum makes smoothies out of stuff from the garden and his sister is a six-year-old master of the Devious Arts, but apart from that - yeah, a totally ordinary family. I mean, his dad is an accountant and you can't get more ordinary than that, can you? Only, one day Jim finds out that his dad isn't an accountant after all. What is he? Not telling. But what he does for a living is dead serious and it's far from ordinary. It's not regular, acceptable, reasonable, rational or imaginable. In fact, if you think about it too much it'll blow your mind. KABOOOM! Once Jim's mind is blown and then sucked back into place again (!mooobak), all hell breaks loose. Not hell hell - this isn't about demons and ghouls; it's just about the trouble you can get into when you own a big, DARK, secret. Oh Jim, what have you done? ​You might have heard how the universe began with the Big Bang? Well, the universe as Jim Wimple knows it is about to end. With a Bazoom! Not only are Bazoom! scooters super fast and deadly cool, but fierce (and swoonsome) older girl Fiona has just started riding hers to and from school, and possibly out of Jim's life forever. Disaster! Jim Wimple needs a Bazoom!, and fast. So he and his best friend Will devise a clever scheme, which involves having to sneak into Dad's workplace. But when the boys break into the Mallet & Mullet 'accountancy' office they find that the walls are lined with ancient portraits, the staff are highly secretive, and Jim's dad's office bears the sign 'G Reaper'...And then all hell really breaks loose. What would YOU do if you thought your dad might be ...Death?! CONTAINS: scooters, snails, secret missions and a discovery that will change Jim’s life forever. Jim is getting to grips with his father's rather unusual job at the Dead End Office and is keeping the truth secret as a promise to Dad. But when Jim sees that Will's grandma is next on the list of Death Dates, he springs into action. Even though Granny Maggot is smelly, mean-spirited and VERY unfriendly, his best friend Will adores her. Jim has to do something! If the boys can keep Will's granny safe until midnight, can they save her life? ​CONTAINS: crisps, cakes, a mad bus driver, a grumpy granny, a fun fair and a race against time! ​When Mum asks Jim to rid their garden of snails, he has an idea. Using the white glove from Dad's study, Jim is going to give each snail a swift and painless death. But can he go through with it? When Mr Darcy the cat gets involved, Jim loses the glove and trouble breaks loose. CONTAINS: cats, snails, accidental death, dead babysitters, gloves and a life lesson. THE ONE THAT DIDN'T GET PUBLISHED! DEAD IMPRESSIVE never made it onto the shelves. But it's one of my favourites! You can have it for free. Click the cover to download this story of crazy dead rock bands, runaway skeletons, really spooky Halloween tricks and true friendship treats.